I was tempted to give you a recipe for a deflated cheese soufflé for the upcoming Superbowl, but decided to rise above deflategate and make these little poppers instead. 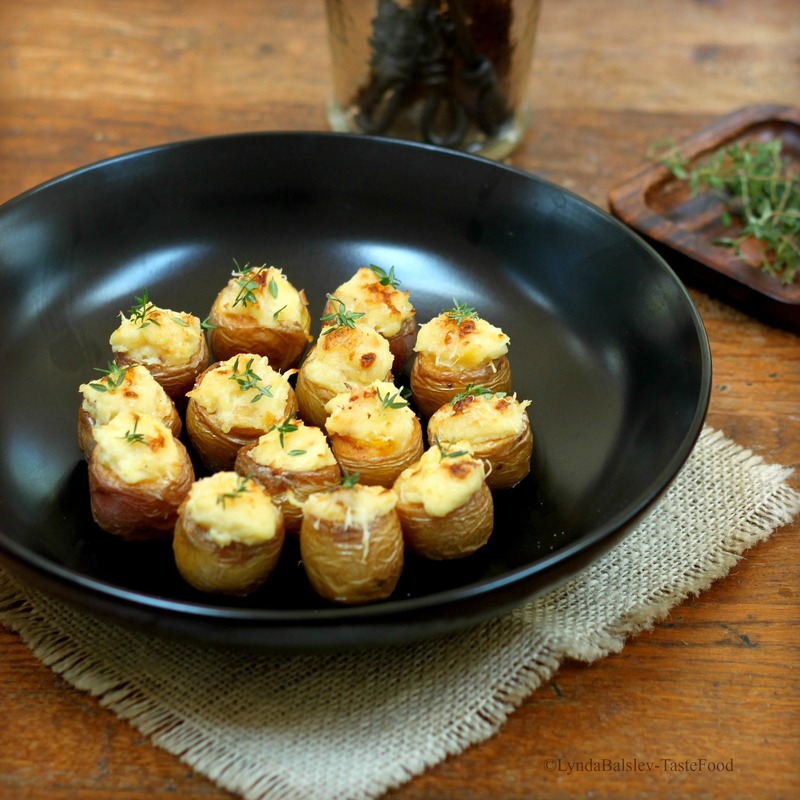 Twice baked mini-potato poppers are a great appetizer to enjoy while watching the big football game. While they are a little time consuming to make, they can easily be prepared in advance then popped into the oven at the last minute. Something tells me that crispy bacon bits would be a great extra addition to the filling…. just saying. If you agree, then consider mixing a small handful of rendered bacon bits into the potato filling, or sprinkle on top in place of the thyme. 2. Trim the potatoes: Slice a small tip off of each potato to create a flat bottom for the potatoes to stand without rolling or tilting. Slice about 1/4 off of the tops and discard the tops. Place the potatoes in a medium bowl with the oil and 1/2 teaspoon salt and toss to coat. Arrange on a parchment-lined baking sheet, top-side down. Bake until tender, about 30 minutes. Remove and cool to the touch. 3. Using a teaspoon, gently scoop out the centers of the potatoes without piercing the bottoms. Place the potato flesh, sour cream, cheddar cheese, butter, horseradish, garlic, 1 teaspoon salt, and the pepper in a bowl. Using a fork, mash until well combined. Carefully spoon the filling back into the potato shells, mounding the stuffing. 5. Heat the oven to 350°F. Top each potato with a generous pinch of Parmesan cheese. Transfer to the oven and bake until the potatoes are hot and the cheese is melted, about 20 minutes. Serve warm, garnished with fresh thyme. Do you know how to make gravalax? My dad just showed me the family recipe. Deflated soufflee takes the cake! Priceless, loved it! great post! Have a nice Superbowl party! I loved this recipe, the colours are amazing! This looks so ridiculously good! I love cheddary, horseradishy dishes. These look really good. I’ve eaten something similar in a restaurant a few years ago, wrapped in bacon and in combination with glazed raisins as a starter. Oh my….I wish I had these for Superbowl Sunday! What a fantastic appetizer!!! I wish I’d seen these earlier – my assignment for a big Super Bowl party was to bring an appetizer! I just made these and they were incredibly delicious!!! Thank you! I’ve made so many of your recipes and love them all!